Well made table. Easy assembly. Beautiful! Add beautiful rustic style to your living space with the Nori Industrial End Table by iNSPIRE Q® Artisan. 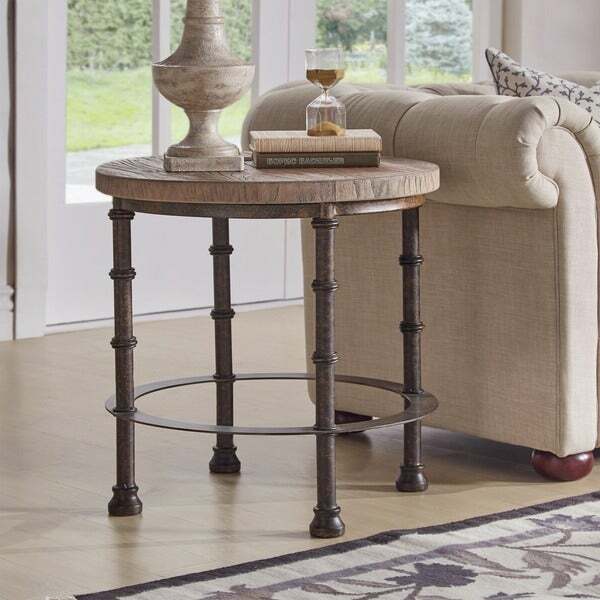 The end table features a rustic elm wood finish table top contrasted by the antique iron base. The base features knot detailing for character. The table is completed by a circular iron base for added support and charming aesthetic. The table is perfect for any industrial, vintage, or traditional styled space, and will match your home decor perfectly. It's perfect for our place! well built beautiful style. I love this table. It looks great and matches the rest of my furniture. I was looking for a table with texture and this was a perfect fit. It looks exactly like the picture. Very happy with this purchase. Really like this end table. Appears well made and was easy to assemble. Provides a modern touch but with traditional appeal. Beautiful end tables! Another great offering from Overstock.com! Arrived quickly and without any damage. Photos on O.co represent the item very accurately. Overall, very satisfied with my purchase! Thanks, O.co! Very sturdy! Would buy again! The top is heavy and it had a very pretty washed look. The bronzed leg is also of good quality and has a bit of a rustic look. So easy to assemble. I love the color of the wood. It's perfect for my living room! Perfect side table for our guest bedroom. Great size, well made. Well worth the price. Was everything that I was expecting it to be. It is a lot heavier than I thought it would be. Love the color looks just like the picture. The legs are very sturdy. Really thinking of buying another one. love it, looks just as pictured! Because it looks well-made, simple, rustic still elegant . Quality and shape. Needed a different table since I had alll three tables with the same design. Needed another end table. So I went with another designand shape.